I stumbled upon this video today... I had skipped it in the past thinking it was some "vile thing". IT IS NOT. This video is amazing and I love it. It is our (you and me; believers in Christ) message to the devil, by faith. It's almost, sorta, kinda an anthem lol. The entire words in the video are written below the video. Satan take notes and listen well. You will not conquer me. You are extremely suttle, but I'm on to your ways. You parade as an angel of light, but I walk in a much brighter Light. Your days of deception are over with me. I won't be deceived, detoured, derailed, distorted, distracted, discouraged or disillusioned by your schemes. Your vile influence will not cross the no trespassing sign on the gate of my heart. My life is off limits to you now. My doors are closed to you forever. You won't walk in, crawl in, slither in, sneak in, pry in, jump in, swim in, fly in, drive in, or barge into my life. I now have a permanent guest (Jesus Christ) that lives inside of me. FACE IT. Your days are numbered, your kingdom is doomed, your designs are dwindling, your evil eroding, your deceit decaying, your deception diminishing and your death is dying (glory be to God). Your victory party has been cancelled and soon your show will be over. You can't trap me with your snares, or defeat me with your deception, because He that is in me is greater than you. 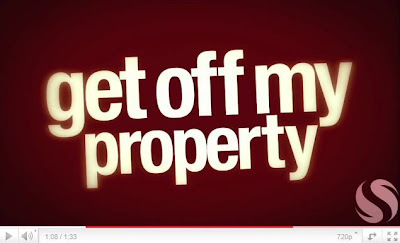 So, GET OFF MY PROPERTY.